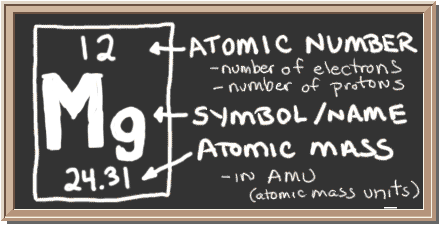 So... for the element of MAGNESIUM, you already know that the atomic number tells you the number of electrons. That means there are 12 electrons in a magnesium atom. 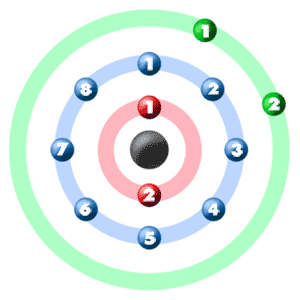 Looking at the picture, you can see there are two electrons in shell one, eight in shell two, and two more in shell three. ► More about the history and places to find magnesium. Magnesium (Mg) is able to bond with one oxygen (O) atom. The formula of the compound is MgO. You can see in the dot structure that the two atoms share four different electrons. When a bond is made with four electrons, it is called a double bond. It is stronger than a single bond which only uses two electrons. Magnesium dichloride is commonly known as magnesium chloride. You can use either name when talking about the compound. 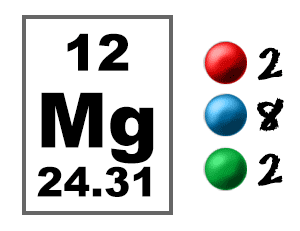 Since magnesium (Mg) has two extra electrons it looks around for elements which could use them. In this case, magnesium bonds with two chlorine (Cl) atoms which each need one electron. With the additional electron, chlorine has a filled shell and magnesium loses two electrons. Magnesium also has a filled shell!